Last Thursday, the LightHouse gathered hundreds of friends, supporters and community members at the Julia Morgan Ballroom in downtown San Francisco for the LightHouse Gala: A Celebration of Blind Ambition. At the gala, which was LightHouse’s largest-ever, we honored blind pioneers, role models and citizens for their audacity and ambition. It was a celebration, a fundraiser and an invitation for our community to partner and become more deeply engaged with the work of the LightHouse. LightHouse CEO Bryan Bashin speaks at the podium. Three gala attendees stand, smiling. LightHouse employee Serena Olsen clinks her knife against her wine glass. A pair of Gala attendees smile stand, smiling with delight. A pair of Gala, including LightHouse Board President Chris Downey, stand smiling. A trio of Gala attendees, including Kathy Abrahamson, embrace, smiling for the camera. A pair of Gala attendees sit, smiling. A duo of Gala attendees stand, smiling. A trio of Gala attendees, including LightHouse CEO Bryan Bashin, stand smiling. Four Gala attendees stand in the ballroom. A pair of Gala attendees stand smiling. A gala attendee holds a young toddler in her arms, smiling. A Gala speaker stands at the podium. With over 300 people in attendance, it was an evening of community and camaraderie. Emcee Erik Weihenmayer, the first blind person to summit Mount Everest, set the tone for our daring evening. LightHouse student Jorge Ellington and his band started the evening right with live Latin Jazz. We honored seven blind leaders throughout the night, and capped off with presentations from our agency’s Holman Prize for Blind Ambition. We were proud to present our new LightHouse Awards: to acknowledge longtime leaders from the field of blindness, who have had a great impact on the community. This award honored trailblazers in education, technology and policy. LightHouse Newel Perry Award was presented to Cathy Skivers by Bryan Bashin. The LightHouse Dr. Isabelle Grant Award was presented to George Kerscher for his work to made electronic books accessible. Erin Lauridsen, Director of Access Technology presented the award to Dr. Kerscher. The LightHouse Chris Buckley Award honored Scott LaBarre and Maryanne Diamond for their work advocating for the Marrakesh Treaty to make books accessible to the global blind community without exception. Benentech’s Jim Fruchterman presented the award. Ceremonial medals were given to the 2017 Holman Prizewinners, who were honored for the completion of their year-long projects which furthered the cause of blindness across six continents in the fields of adventure sports, entrepreneurship and cultural exchange. Holman prizewinner Penny Melville-Brown recounted her perilous, near death car accident and subsequently meeting and marrying the love of her life. Ojok Simon spoke of teaching over 45 blind people the art of beekeeping this year, and brought honey from Uganda to share with all. Ahmet Ustunel imparted his kayaking adventures in Turkey, and the technology he crafted to aid blind kayakers navigate independently. 2017 Holman Prizewinners stand with LightHouse CEO Bryan Bashin. LightHouse Gala emcee Erik Weihenmayer stands with a smile, speaking at the podium. An auction bidder holds up his sign marked “110” with enthusiasm, in a crowd of cheering people. A trio of Gala attendees stand smiling. A pair of Gala attendees, including LightHouse Award winner Scott LaBarre stand smiling. A group of five Gala attendees stand smiling. A large group of Gala attendees stand smiling. A group of six Gala attendees stand, smiling. Penny Melville-Brown and her partner stand smiling. A group of four gala attendees, including LightHouse Board Member Josh Miele sit smiling at a dinner table. A large group of a dozen Gala attendees pose for a photo – one row sitting at the dinner table, with another row standing behind. Erin Lauridsen stands beside LightHouse Award winner George Kerscher at the podium. Julie Cabrera, and Enchanted Hills camper who grew up to be a counselor helped us raise funds to rebuild the Wing Creek Chapel and accessible nature trail at Enchanted Hills, which were destroyed in last year’s Wine Country wildfires. The evening supported the life-changing programs of the LightHouse with a portion supporting to Enchanted Hills Camp for the Blind. The event raised over $180,000. Thank you to our sponsors. On November 29, 2018, we hosted the first-ever LightHouse Gala at the Julia Morgan Ballroom in San Francisco. The full gala tickets included access to a pre-dinner cocktail hour, our Gala dinner and awards, and live auction with fabulous packages. We can’t wait to have you again in 2020. Holman Prizewinner Penny Melville-Brown embraces her partner, smiling. 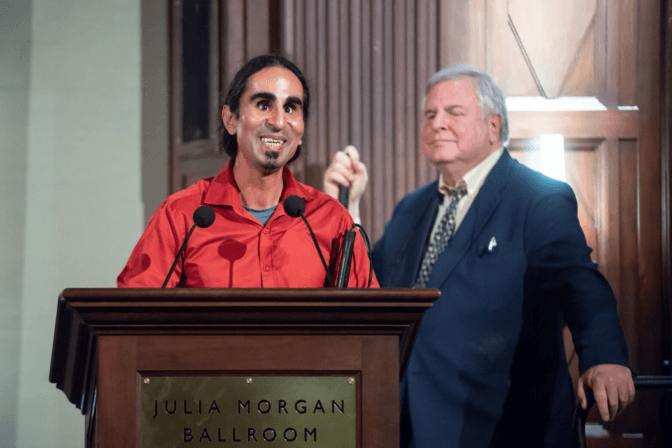 Holman Prizewinner Ahmet Ustunel stands at the podium to speak, with LightHouse CEO Bryan Bashin standing to his right. Holman Prizewinner Ahmet Ustunel at right and Sarahbeth Maney at left. A group of Gala attendees clap, smiling, seated at tables. 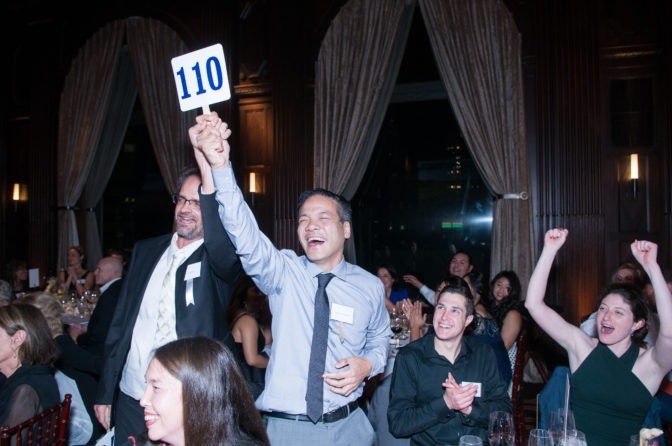 An auction participant raises his number triumphantly, donning a wide grin, amidst a crowd of cheering Gala attendees. 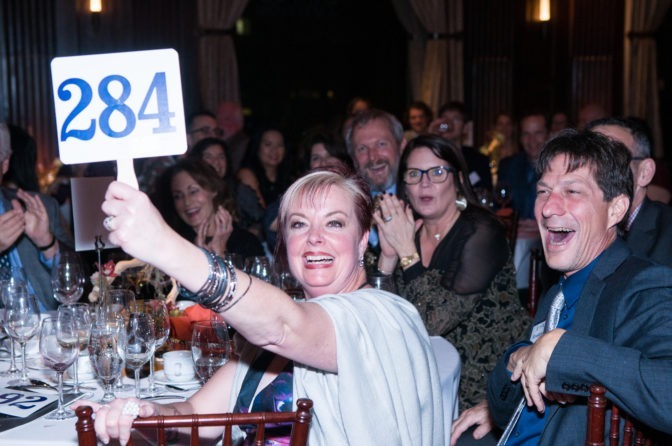 A seated auction participant raises her numbered sign with a smile, alongside a group of cheering people at her table. Kim Starr, Bobbi Pompey and Lisamaria Martinez sit at a dinner table during the auction. A group of nine Gala attendees stand and sit together in a group, all looking relaxed and delighted. A medium shot of the Julia Morgan Ballroom during the Gala, with full tables of people, and illuminated screens with a graphic that says “LightHouse for the Blind and Visually Impaired”. For 116 years, LightHouse has served California and supported people with blindness or low vision to live full lives. We are the place where blind people come to learn skills and to gain confidence and independence. At the LightHouse people connect with resources, peers and mentors. Every day we prove that with access to information and training, blind people can live as confident and effective employees, students, and community members. In addition to awards for outstanding members of our community, innovative organizations and our valued sponsors, the evening also featured the stories of our first three winners of the Holman Prize for Blind Ambition, who will have just completed their year-long Holman adventures. We look forward to sharing an exceptional night together in celebration again in 2020. 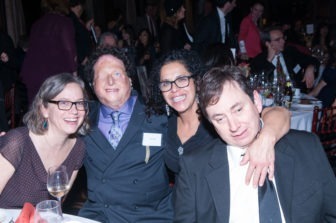 The Gala benefits LightHouse for the Blind’s transformational programs including Vision Rehabilitation, Community Services, Employment, Technology, and Accessible Design, as well as the annual Holman Prize for Blind Ambition and Enchanted Hills Camp for the Blind in Napa.